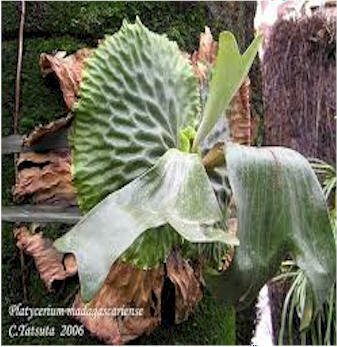 P. madagascariense (madagascar-e-en-se) A rare species, small to medium sized, with shields like no other platycerium. Their veins form tall ridges which surround little valleys. New shields are thin and light green, but turn rich dark green when they mature. 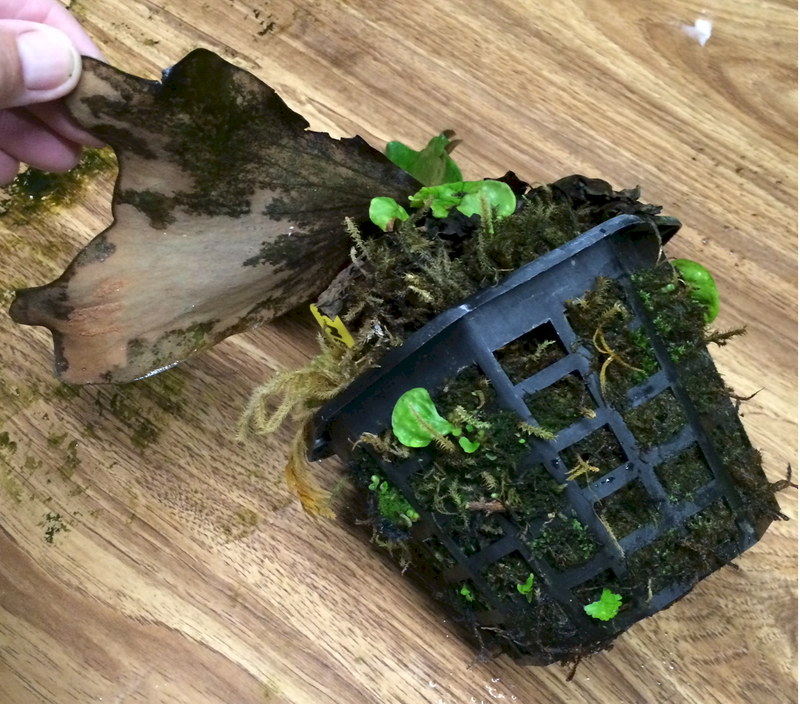 The shields cover the top of the moss and do not collect debris behind them. In nature, ants live in the shield fronds which may provide the fertilizer. Fertile fronds are wedged shaped with 1 to 3 shallow forks. Sore patches grow on the tips of the fertile fronds. The bottom of the fertile frond is brownish and looks like a very large spore patch, but closer observation show the spore patch on the tips. 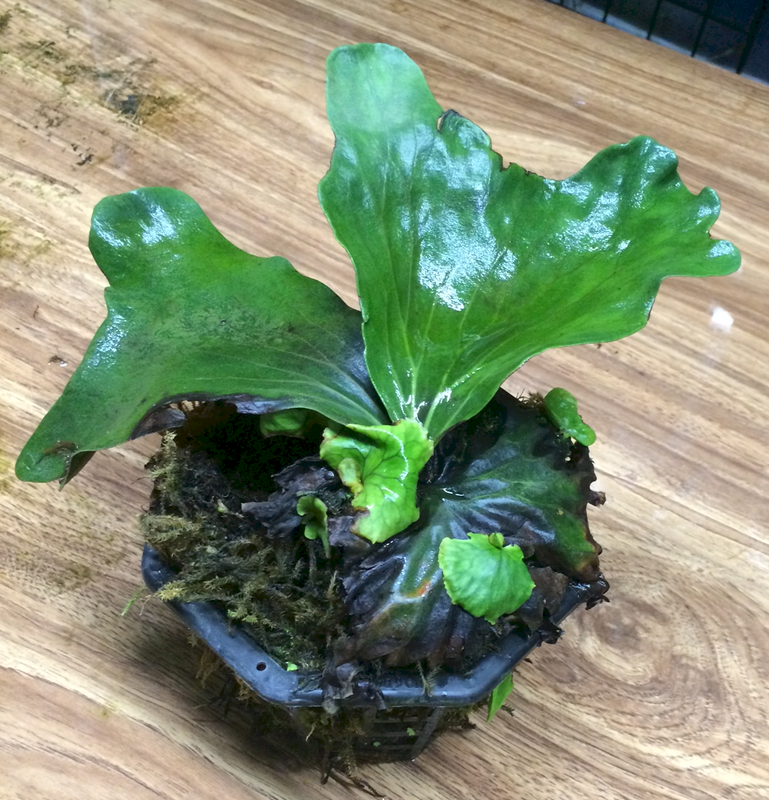 As the plant matures, the base tends to form a spherical shape. 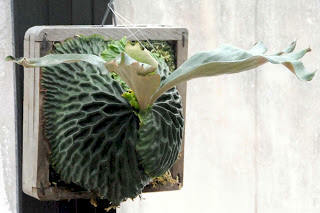 As more pups form from the rhizome, the plant forms a ball shape with pups growing everywhere. Roy Vail suggests "removal of pups is often not successful, ... pups should be allowed to become rather large before being cut off." Not knowing this I successfully removed 7 pups ranging from 1/2 inch to 3 inches and did not lose any. In 5 months I now have another crop of pups to remove. I placed the pups on a bed of sphagnum moss in an orchid pot with many slots/holes. 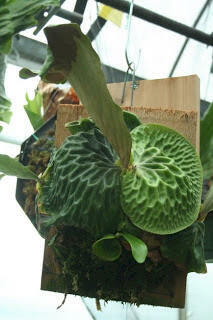 Misted daily, the small ones are almost 2 inches across and have grown new shield fronds. Click the photo on right to see a larger image. 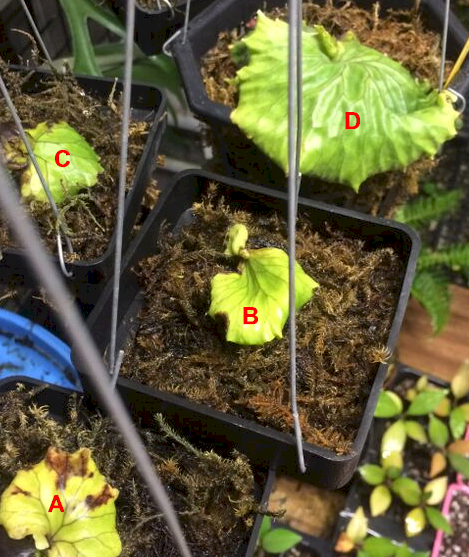 Each plant is labeled, A, B, C, D. The first 3 are in 4 inch orchid pots, the 4th is a 6 inch orchid pot. Roy Vail says "Spore culture is not considered unusually difficult. Sporophytes are allowed to become 2.5 cm (1 inch) across before they are transplanted. The other gametophytes seem to wait their turn before forming sporophytes. One culture (of spore) may produce sporophytes for two years. That may be what is happening on my madagascariense that is so proficient. Further thought leads me to think that the moist moss under the fertile fronds may be an excellent breeding medium fore sporelings. 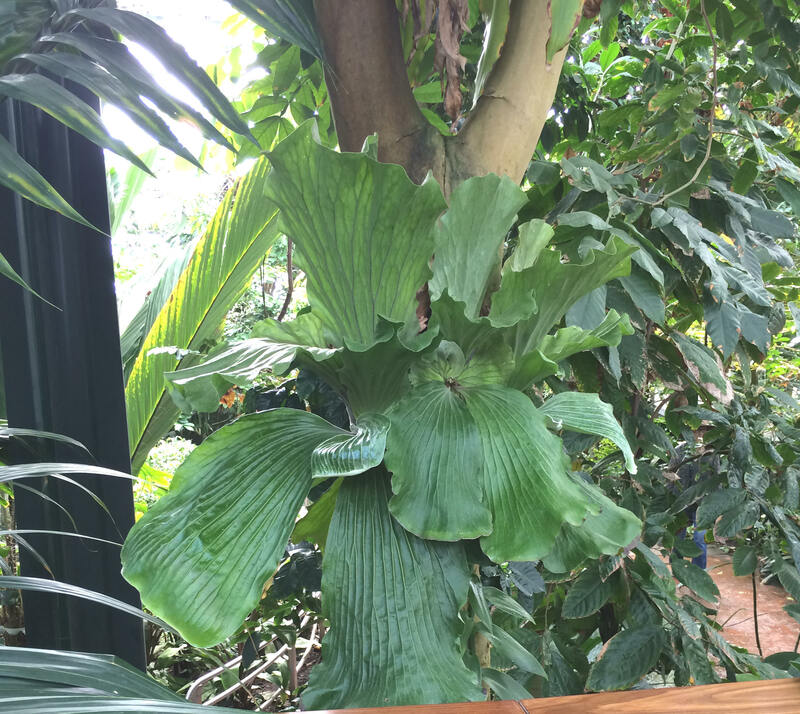 Considered a challenging plant to grow, it has been successfully grown in temps 32°F to 110°F but the extremes should be avoided and best grown in a greenhouse environment with lots of humidity. Andy at Andy's Orchids in Encinitas says he has P. madagascariense growing like wild weeds and claims it is because he has Reverse Osmosis, RO, watering. When these plants leave and are watered with city water, he says they do not grow well because of the chlorine and chemicals in city water. This leads me to think that filtered bottle water or distilled water may also be good for the P. madagascariense if RO water is not available. 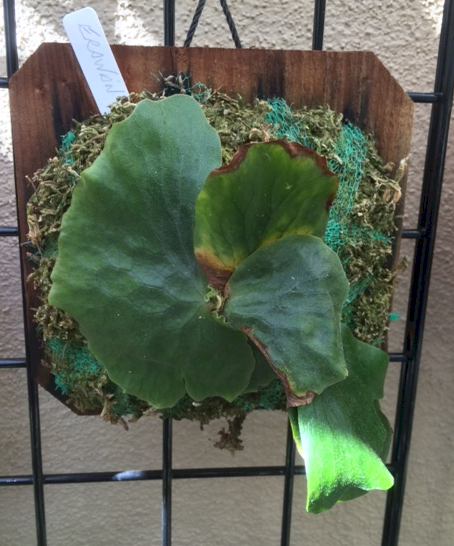 Right, this blue ribbon winner from the San Diego Fern Society demonstrates the spherical shape the base forms with age. 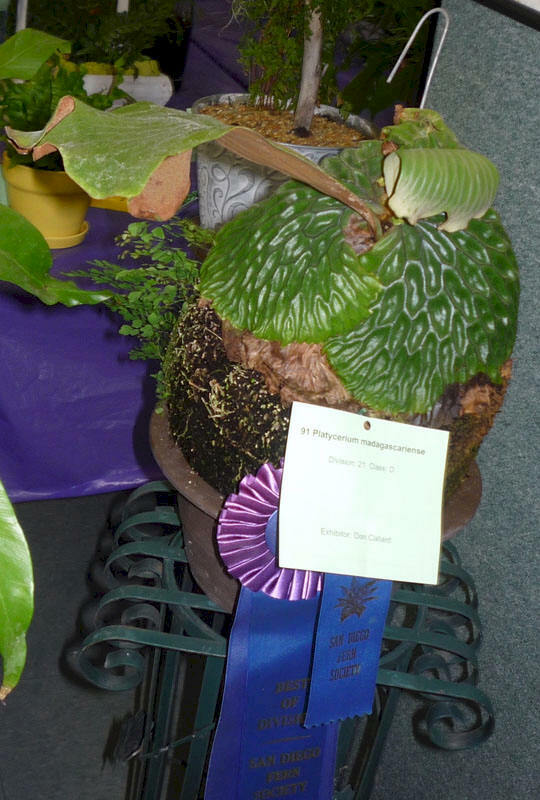 This plant was displayed by Don Callard. Left Photos from the TropicalFerns.com web site. Common sense suggests these new sporelings are actually volunteered pups growing from the rhizome. 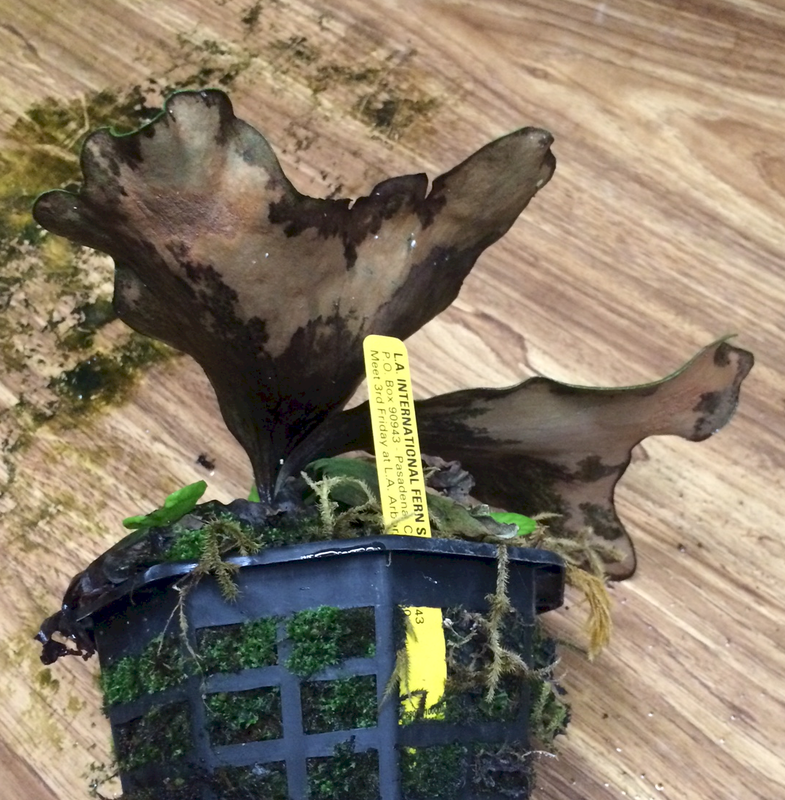 However when removing them from the mother plant, they are not connected suggestion they are actually sporelings that have grown from spore falling off the fertile frond into the spagnum moss. This small platy is from Tom Gauci's collection. Not sure if it is a hybrid or a sport of P. madagascarienes. The shield fronds show the P. madagascarinese waffling. It is labeled P. erawan.